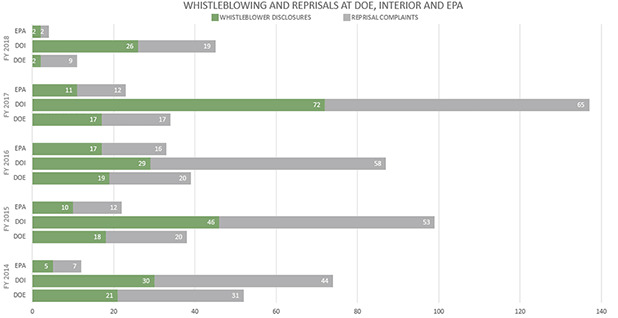 Interior whistleblower complaints rise — but why? Six months after he started work at the Interior Department, Matthew Allen says he became a marked man. Hired as communications director for the Bureau of Land Management in the fall of 2016, Allen was praised by then-BLM Director Neil Kornze for being cool under pressure and having a resume that included military service as a combat engineer. But his fortunes changed after Donald Trump moved into the White House. Political appointees, Allen said, began calling him "Neil's guy" and excluding him from meetings. And then came insinuations, he said, that he was leaking reports to the press about Interior Secretary Ryan Zinke's plans to overhaul national monument designations. "I was viewed with some skepticism as I might have been someone hired as a plant or mole by the last administration on their way out," Allen said in a recent interview. Allen, 38, who was demoted last year, is part of a growing number of Interior employees filing complaints with the independent Office of Special Counsel (OSC) alleging retaliation or blowing the whistle on alleged mismanagement, wasteful spending, abuse of authority, and perceived dangers to public health or safety. In Allen's case, Interior officials cited "performance deficiencies" and accused him of failing to collaborate with others in his office or provide a new media strategy. For his part, Allen says he was outed for blowing the whistle on the agency's unwillingness to answer public inquiries on national monuments. Allen filed a complaint with the OSC last fiscal year, one of 65 such retaliation cases the agency received from the Interior, up from 58 the previous year. OSC also saw whistleblower complaints rise, according to data obtained by E&E News. Seventy-two Interior employees lodged whistleblower complaints with OSC in fiscal 2017, up from 29 the previous year. Interior warned against basing any conclusions on the OSC numbers or Allen's case. "These numbers are completely without context," deputy press secretary Faith Vander Voort said in an email. "This is a false comparison of different years, administrations, and departments. Any attempt to create conclusions based on these figures would be intellectually dishonest to the American public." Some ethics watchdogs agree — in part. Jeff Ruch, executive director of Public Employees for Environmental Responsibility, said the numbers don't reveal whether there's more misconduct at the agency, comparing OSC data to "the blind man and the elephant." To know more about what's fueling complaints at the Interior, he said, would require a deep investigation into where the OSC filings originated and more. When asked for details, OSC declined to say more about the locations and nature of the complaints it received, saying its internal systems don't allow for easily analyzing data associated with incoming complaints. But Ruch also pointed to an Interior internal survey last year that found more than a third of surveyed employees reported having been harassed or discriminated against over the past year (Greenwire, Dec. 14, 2017). That survey, he said, provides "context" for the whistleblower complaints. Others said the OSC numbers show an undeniable trend. "That number in the increase of complaints is remarkable, it demonstrates there's something very wrong going on," said Michael Kohn, an attorney at the law firm Kohn, Kohn & Colapinto LLP and president of the National Whistleblower Center. "The data demonstrate there's a real problem," he said. 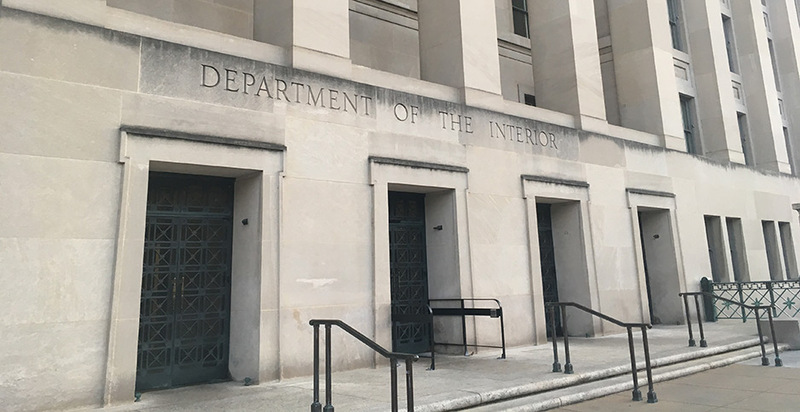 The rising number of Interior complaints could stem from wrongdoing or reflect disparate people from different parts of the country raising concerns about Zinke's tenure, said Nick Schwellenbach, a former OSC spokesman and now director of investigations at the nonpartisan Project on Government Oversight. When asked about the uptick at the Interior, OSC spokesman Zachary Kurz said the office is creating a new case management system to improve its understanding of reports that stream in from more than two dozen agencies. Until that transformation is complete, he said, it's difficult to accurately determine a specific reason behind an increase in disclosures for any given agency or year. "We're looking to get new capabilities to be able to track our data," Kurz said. In April, Interior's inspector general found the reassignments of more than two dozen senior staffers were poorly documented, lacked sufficient reasoning and left some officials in the dark (Greenwire, April 11). "Clearly, there's a much larger group of people bringing forward allegations of wrongdoing from the Interior," Schwellenbach said. "At a minimum, it does indicate a greater awareness of OSC as an outlet for Interior Department whistleblowers." During his time at OSC, from 2014 to early 2017, Schwellenbach said a scandal at the Department of Veterans Affairs caused whistleblower and retaliation complaints there to skyrocket. He said he's not sure it reflected a greater problem at the VA but said it did show more employees knew of the OSC's role. Schwellenbach said the Interior data might reflect more awareness of the special counsel. He noted the case of Joel Clement, a top climate policy adviser who filed a complaint with OSC that's already sparked several investigations and drawn considerable press attention. Clement said he was removed from his position in retaliation for speaking publicly about the dangers of climate change to Alaska Natives. "That could also explain a greater awareness ... but I'm just sort of spitballing," Schwellenbach said. Katherine Atkinson, an attorney with the law firm Wilkenfeld, Herendeen & Atkinson who represents both Allen and Clement, said she opted to file her clients' complaints with OSC because the office is independent and she has confidence in its investigative skills. She also reflected on the double-sided nature of the increase in complaints. "On the one hand, it raises concerns about what's happening at the Department of [the] Interior," she said. "On the other, I'm glad to hear that employees are reporting it so the Office of Special Counsel can do what it was created to do and investigate." The Office of Special Counsel, created in the 1970s in the wake of the Watergate scandal, isn't the only path for whistleblowers. Federal employees can also turn to their department's Office of Inspector General, which can receive anonymous tips through hotlines. The OIG also provides employees with a whistleblower protection ombudsman to speak about potential retaliation and whistleblowing, their rights, and remedies if they've been wronged. When asked about the OSC numbers, EPA's inspector general said reports weren't categorized according to "whistleblower" and "retaliation," making a comparison difficult. Even so, Nancy DiPaolo, a spokeswoman for the Interior IG, provided a graph showing a "ballpark" number of cases the IG decided to pursue in which whistleblowing and retaliation were the key issues. According to that graph, whistleblower cases — which could overlap with the OSC's numbers — rose at the agency in 2015 under the Obama administration before decreasing, while reports of retaliation have slowly increased since fiscal 2014. DiPaolo noted Interior's inspector general doesn't typically investigate a matter if the OSC is already on the case. "If the case is being handled in one of the other appropriate venues, we typically don't open it," she said. But PEER's Ruch questioned the helpfulness of those numbers, noting that inspectors general don't have authority to take action on reprisal complaints. Ruch also noted inspectors general and the OSC collect and label incoming complaints differently. "People don't bring automobiles to a bicycle mechanic," Ruch said. "It's apples to guava." Kohn, the attorney and president of the whistleblower center, said most whistleblowers file complaints with the Office of Special Counsel because it's their only option and the office will conduct an investigation while providing clients with information throughout the inquiry. But he also said OSC has limited resources, and the depth of the office's investigations are limited. And if OSC does find evidence of retaliation, the cases may be sent to the Merit Systems Protection Board — an independent, quasi-judicial agency that reviews civil service merit principles and has been lacking a quorum for more than a year now. Among the 1,126 cases pending before the board is an appeal from the BLM's Allen. Last September, Allen was demoted from his role as BLM communications director — a probationary senior executive service position — citing "performance deficiencies." Allen denies those allegations — he says top Interior staffers pegged him for a whistleblower and accused him of leaking agency documents to The Washington Post. He also notes in his complaint he's never received a negative review in his more than a decade with the federal government. He's since been reassigned to the Bureau of Safety and Environmental Enforcement, which focuses on offshore energy development. The department says the new post fits his background and expertise. But Allen, who lost his external engagements and no longer oversees other employees, disagrees. He's never set foot on an offshore rig nor does he have training in energy. "They would have been better moving me to the Office of Insular Affairs," he said, "because I've at least visited tropical islands."